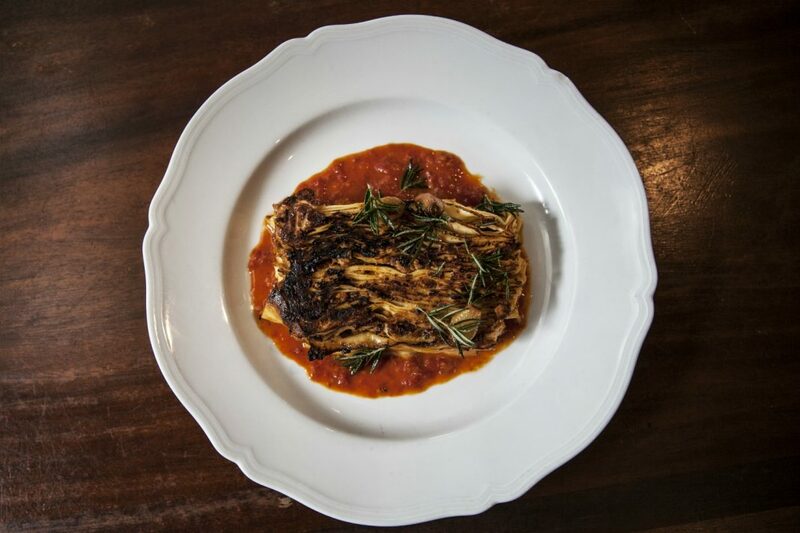 At his upscale vegan restaurant, Tal Ronnen fills his lasagna with soy mozzarella, spinach, and Kite Hill “cultured ricotta cheese” that’s made from almond milk. The marinara sauce is more traditional: It’s a family recipe from executive chef Scot Jones, thickened with grated carrot for texture. 8284 Melrose Ave., Beverly Grove. The unusual spin that Casey Lane serves looks a little like a broiled accordion. Ribbons of pasta are layered with what the menu dubs the “world’s best Bolognese” and crisped until the noodles turn crunchy. It’s basically one giant corner piece. La Peer Hotel, 623 N. La Peer Dr., West Hollywood. Top Chef champ Mei Lin tucks ample surprise into her menu, but most cheeky is her unassuming lasagna. In lieu of ragù, Lin fills sheets of egg noodle with a spicy mapo tofu-like ground-pork sauce and rich tofu cream. 923 E. 3rd St., Ste. 109, Arts District, nightshadela.com. A Los Feliz gem, La Pergoletta might be most famous for its rib-sticking lasagna Bolognese. Order it boscaiola, or woodsman style, and the kitchen will ladle on a lush mushroom sauce that kicks up the richness. 1802 Hillhurst Ave., Los Feliz.